STILLEN Power Hood / Cowl - Dezod Motorsports Inc - Home of the automotive performance enthusiast since 2002. 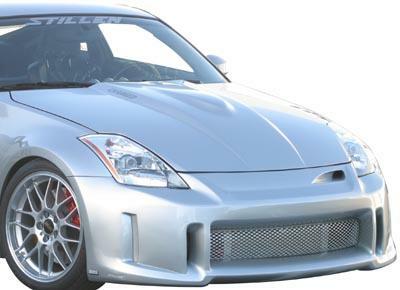 The new STILLEN hood for the 350Z / G35 provides a unique style and affords the necessary engine bay clearance for our new twin screw supercharger. Two finishes are available, Fiberglass or Carbon Fiber. Fiberglass hoods come ready for final prep and painting, and the Carbon Fiber is hand made of high quality carbon fiber, no painting is required. Uses stock hardware for mounting. Due to the size of the hood, this will not ship via UPS or FedEx. Shipping is by truck line only. Call for shipping estimates to your location. Another option is the Power Cowl, which will also provide the necessary hood clearance for the Stillen supercharger. They are also available in either Fiberglass or Carbon Fiber. A template for cutting an opening in the stock hood is provided as are installation hardware and instructions.